For many Muslims, this is a demoralizing time testing the bonds of civic responsibility. The hijab, burka, and niqab — three types of religious coverings worn by Muslim women — have been targets of intense controversy throughout 2016. In France, a battle over the “burkini” has sharply divided the country. In Germany, Angela Merkel recently proposed a ban on the burka. This battle has migrated to numerous other European countries and has become a useful ploy for politicians looking to stir up outrage. In the US, hate crimes against Muslims have soared since the election of Donald Trump, who said he would start a Muslim registry when running for president. This top-down spread of hatred has had ugly manifestations in everyday life. In California three mosques received notes that said the President-elect would deal with Muslims as Hitler dealt with Jews. Dozens of similar incidents have happened. Earlier in the week, for example, the Somali politician Ilhan Omar was viciously berated by a cab driver in Washington. For many Muslims, especially women, this is a demoralizing time, testing the bonds of civic responsibility — when a garment as simple as the hijab provokes the worst kinds of rage, it seems hostility lurks behind every interaction. Fear of being attacked has caused many Muslim women to question whether or not they should wear a hijab. But there are incidents of kindness and tolerance pushing back against the narrative of hate. 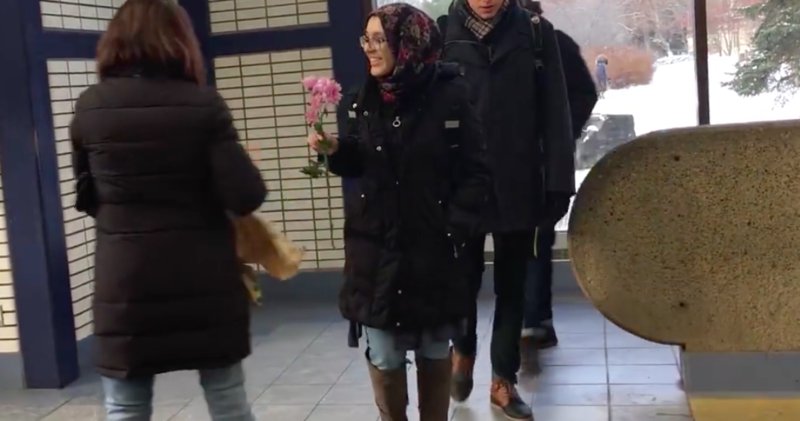 Recently, in Edmonton, Canada, volunteers spent the day handing out flowers to women wearing hijabs as a small gesture of love and unity, a reminder that friendly people still exist who look beyond superficial differences to the core of humanity binding each person. The idea was hatched after news of a man who threatened two Muslim women with a noose in a subway station spread throughout the country. Other subway stations have become impromptu sites of kindness. In New York’s Union Square subway station, a therapist set up a table with Post-it notes and encouraged people to write notes of love to stick onto a wall. Soon, the wall was covered in words of solidarity and hope. It was a moving reminder that many people believe in goodness. As you move throughout your daily life, remember that you too can make someone’s day with a kind word or gesture.